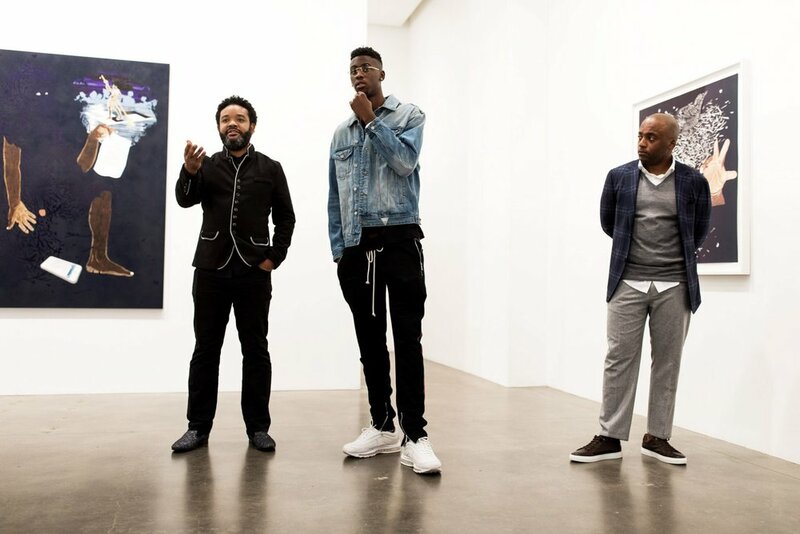 Caris LeVert arrived at a mostly empty West Side art gallery for a private showing late last October. William Villalongo, an artist, walked around with him that evening, describing his dozen or so works hanging on the walls. LeVert, a second-year Nets guard, is a neophyte in the art world. His father, Darryl, had been a graphic designer and drawn family portraits, but LeVert was in unfamiliar territory. There is also the creativity that both groups possess. Much the way a game cannot be replicated, each painting is one of a kind. For LeVert, the evening was part of an immersion. He had recently begun learning more about art but was not yet intrepid enough to buy anything. For now, art is a burgeoning hobby. In time, though, it could lead him to become a collector. N.B.A. players have grown more interested in art in recent years and created a new market of consumers and enthusiasts. 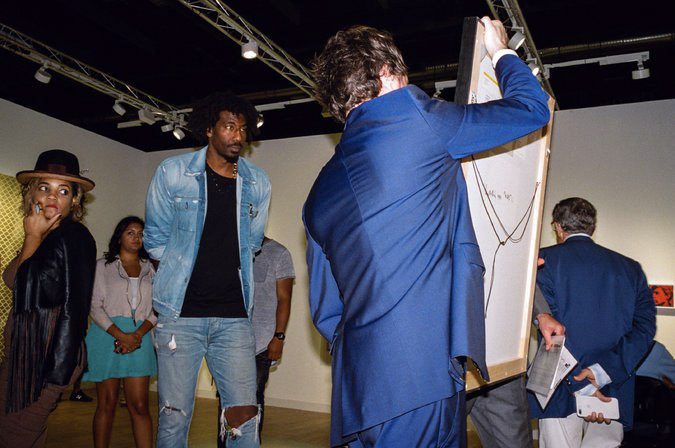 Former Knick Amar’e Stoudemire has amassed a notable art collection and served as a league tastemaker. Grant Hill’s African-American art collection has been exhibited at museums. Former Suns guard Elliot Perry is known league-wide for his impressive trove. So what was once a small niche of N.B.A. collectors has flourished into something larger. Numbers are difficult to come by, but Price estimated that two players on each team he’s played for — he’s been with Sacramento, Utah, Phoenix, Portland, Orlando and the Los Angeles Lakers — have had collections. And in the middle, serving as a liaison to the art world, is the longtime New Yorker Gardy St. Fleur. Born in Port-au-Prince, St. Fleur grew up with art as a central part of his life. His father collected Haitian masters and commissioned work for local artists. His family moved to Brooklyn when he was a child, and St. Fleur spent his adolescence and early adulthood learning from artists. He befriended Ionel Talpazan, the New York City artist famous for painting extraterrestrial life, worked as a studio manager for Villalongo and, he said, regularly grabbed coffee with Emmanuel Benador, an art dealer. And he became just as interested in the artists as in their work. After a job out of college working in e-commerce, St. Fleur decided to follow his passion. Villalongo introduced him to Peggy Cooper Cafritz, who had a prestigious African-American art collection, and she gave him an assignment: Help her find new artists who were finishing graduate school. Not long afterward, he decided to push into the art business full time. And from there came his involvement in the N.B.A. ecosystem, a relationship built in part from the days when St. Fleur would hang around the Rucker Park and West Fourth Street basketball courts in Manhattan, meeting people who eventually became player agents. Getting to know Deron Williams, the former Nets guard, became fruitful, too. Williams was looking to build an art collection, not just acquire a few pieces. So St. Fleur got involved, and soon his name began to hopscotch around the league. He has worked with Houston Rockets forward P. J. Tucker, Hall of Famer Alonzo Mourning and Yankees pitcher C. C. Sabathia, among others, he said. Knicks guard Courtney Lee was connected with him through the team, St. Fleur said, after he had previously built a relationship with Carmelo Anthony, the former Knicks star. N.B.A. veteran Dahntay Jones started talking to St. Fleur about art while he was working out at Manhattan’s Sky gym last summer, where Anthony held his popular “Hoodie Melo” scrimmages. In his work, St. Fleur has tried to be as much teacher as salesman. He introduces athletes to artists, trying to break through the intimidation that affects some players. St. Fleur sends out newsletters to enlighten players, ships books to display different artists and styles, and texts photos of works to players if he believes one or more of them might be interested. Sometimes, he’s there to caution a player against overpaying. You don’t need millions to buy art, he often says. When Jay-Z released his latest album, “4:44,” St. Fleur was flooded with text messages. A song, “The Story of O. J.,” with its references to buying artwork, had served as a jolt to some players, reinforcing what St. Fleur had been telling them for years: that art can also be an investment and a way for generations to create something to pass down. This evolution all took a while. In the mid-1990s, when Perry was in the middle of his N.B.A. career, he was virtually alone as he started his collection. He had turned to art almost by accident. In 1996, Perry was seated next to Darrell Walker, the former Knicks guard, on a long flight to Japan for an exhibition tour led by Charles Barkley. Walker asked him if he knew anything about art. The next season, Walker began helping Perry explore. When Perry came to New York, Walker called with instructions on which gallery to visit. When he went to Boston, Walker recommended a studio. Perry got to be so insatiable that he would arrive in a new city, drop his bags in his hotel room and go studio-hopping to find new works. He began reading, too, learning about Renaissance artists and American painters who emerged in the 1930s with the support of the federal Works Progress Administration. Still, it took a year until Perry was comfortable enough to buy his first piece. Entering the art world had been overwhelming. At first, Perry built a collection from works by African-American artists. Motivated by a quote in a catalog he had received at a showing of works owned by Walter O. Evans, a renowned African-American collector, Perry later decided to purchase only work from artists he could meet in person, get to know and support. He called Walker the day he decided to take that approach. The heightened interest in art from N.B.A. players would seem to dovetail with their increased influence on American culture. And it has made art something of a conversation starter in N.B.A. locker rooms, where, not long ago, Lee, Michael Beasley and Jarrett Jack of the Knicks were discussing kre8artafax, an artist they discovered on Instagram.